Vitamins & minerals play a key role in boosting the immune system, growth & development, mental aptitude, physical fitness & in supporting the body's systems. Eating a variety of healthy foods is the best way to get all the vitamins & minerals you need each day but many skip meals, diet or do not eat enough items from a particular food category, such as vegetables or dairy. 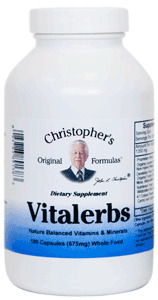 The market is flooded with standardized supplements, which extract leading active ingredients but Dr. Christopher's Vitalerbs is the ultimate whole-food formula, perfectly balanced the way Mother Nature intended with vitamins & minerals.